Provides comfortable and convenient joint measurement. Enables easy measurement of the joint's ROM. High-quality product to ensure long life and repeated use. 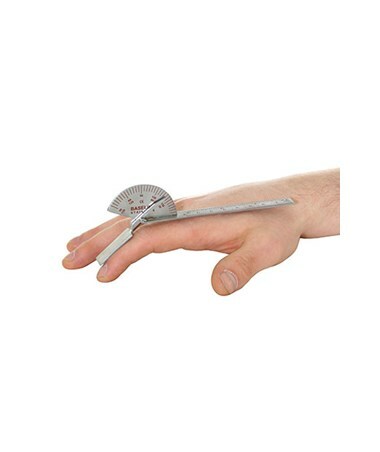 The Baseline Stainless Steel Finger Goniometer measures range-of-motion (ROM) of finger joints (metacarpophalangeal and interphalangeal) and other small joints including toes. The finger goniometer is constructed with stainless steel to ensure longevity and reliable measurements through every use. The Baseline Stainless Steel Finger Goniometer is available in three different versions which enable accurate and effective measurement of joint range of motion for diagnostics, progress tracking, and treatment planning. 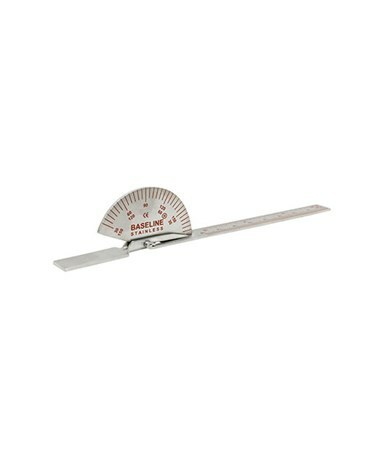 The Small 3.5" stainless steel finger goniometer has a head with opposing 180° to 30° scales in 5° increments. The Standard 6" stainless steel finger goniometer has a head with opposing 180° to 30° scales in 5° increments. It also has an arm with a linear scale which measures in inches and centimeters. 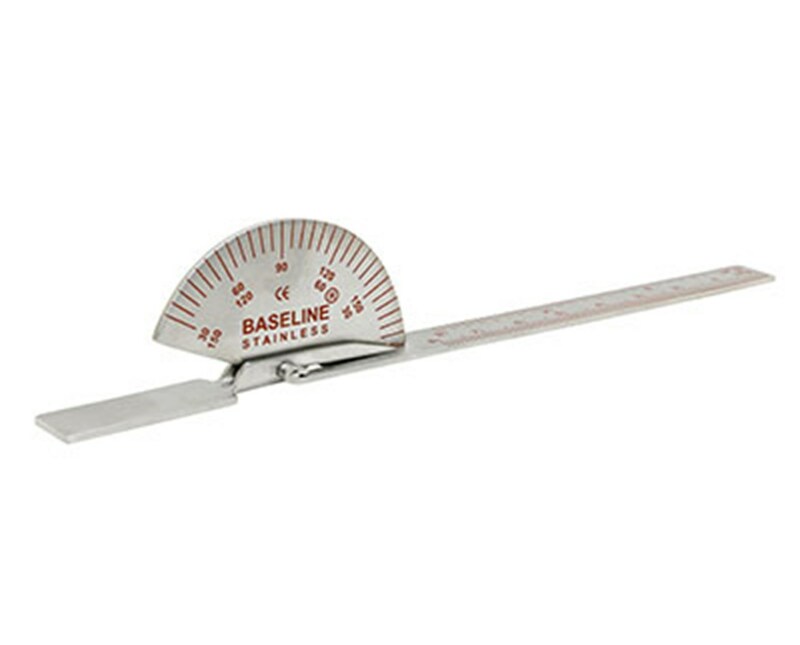 The Deluxe 6" stainless steel finger goniometer has an extra-large head with opposing 180° to 0° scales in 5° increments. It also has an arm with a linear scale which measures in inches and centimeters. (12-1010): Baseline Stainless Steel Finger Goniometer - Standard - 6 inch. (12-1015): Baseline Stainless Steel Finger Goniometer - Small - 3.5 inch. (12-1011): Baseline Stainless Steel Finger Goniometer - Deluxe - 6 inch. (12-1010-25): Baseline Stainless Steel Finger Goniometer - Standard - 6 inch. (12-1015-25): Baseline Stainless Steel Finger Goniometer - Small - 3.5 inch. (12-1011-25): Baseline Stainless Steel Finger Goniometer - Deluxe - 6 inch.